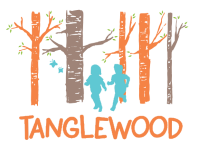 Tanglewood offers half day and full day programmes for schools on Cannock Chase at Marquis Drive Visitor Centre in association with Staffordshire County Council. Each session links with the national curriculum and offers a number of hands-on activities for Key Stage 1 and 2. Venture through our magical woodland looking for the Tanglewood Teddies! A beautiful half day of storytelling and fun activities based on how woodland animals survive. Our most popular programme. Did you know Tanglewood has magical fairies and dragons? 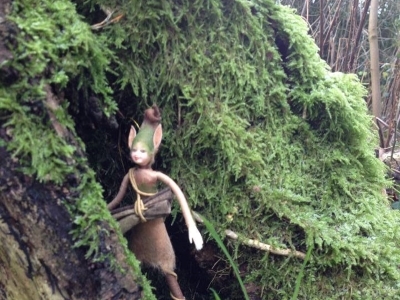 Come and search our woodland for a very cheeky dragon called Norris, build fairy houses and meet the Bogats! 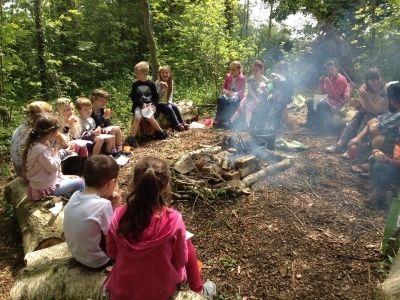 For a full day enjoy stories, songs and toasting marshmallows around a campfire. A perfect day to watch those little imaginations grow. Key concepts: Imagination, speaking/listening, creativity, social skills and understanding of the natural world. After a short presentation on wildlife and trees, go on a woodland adventure using all your senses. A great programme for introducing the children to new surroundings. We will hunt for minibeasts, create animal homes and play games. After a woodland habitat presentation, venture through our woods identifying trees, plants and animal signs. The children will discover habitats, learn about food chains and germination and enjoy the art of minibeast hunting. After lunch we continue to delve in to the world of habitats with some fun seasonal activities. Pond dipping available at certain sites, please enquire. This programme is all about art — outside art! We venture in to the woods, get inspired and create some amazing natural masterpieces for your school. You will be amazed at how imaginative the children become and what we achieve individually and as a group. Have you got what it takes to survive in the woods? Complete a series of challenges including den building, fire lighting and some hidden surprises! Team work at its best! Step back in time to the Stone Age and discover how life used to be. Create your own tribe and learn how to be a “hunter gatherer”. Build a temporary shelter, forage for food… let’s hope it isn't poisonous, stalk a sabre tooth cat, learn how to create fire and much, much more. Discover how the soil and rocks of our woodlands affect how trees and plants survive. Learn about the uses of tree and rock products and the ways in which the ground beneath benefits us in everyday life. Activities also include creating your very own plaster cast fossil to take home with you. Explore our woodland or heathland habitat (site specific) and take an in-depth look at the flora and fauna. Investigate adaptations, food chains and photosynthesis together with the uses and threats to the habitats today. Who will be the superhero survivors that have stood the test of time? This day is all about end of term fresh air and fun! The children have worked so hard, now it’s time to shake it off and get “Tangled!” A fun packed day full of games, challenges and team work. SATS…. what SATS? Key concepts: Fun, exercise, teamwork, communication and shaking off SATS! If you see 2 separate activities you like the look of, let us know and we can create a day that suits your requirements - Feel free to get tangled! Dear Tanglewood, I would just like to send a huge thank you following our Tanglewood day with St. Filumenas School reception class on Wednesday. I am only a parent who was asked to accompany the children so not a teacher myself, but felt strongly that I should personally send my thanks on such a wonderful day. Rowan, our guide, was absolutely fantastic; she engaged brilliantly with the children, making them laugh, and totally immerse themselves in the whole experience. She gained the children's respect from the beginning and kept them engaged through out. As a mum of three, eldest 10, I have participated in many school and personal day trips and I have to say that Tanglewood was one of the best. I have been singing your praises ever since! Thank you once again on behalf of the 3 parent helpers who all agree it was wonderful!